Well, I'm reaching. Obama didn't specifically mention the politically perverted redistricting that goes on in Illinois. 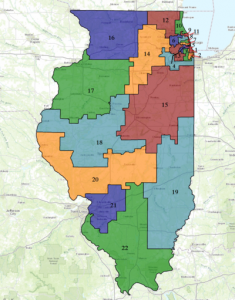 But Obama's plea for redistricting reform applies to Illinois. In spades. charge of redrawing legislative and congressional districts in Illinois for decades. No surprise, the maps have been drawn to favor Democrats, especially, incumbents. You need only to glance at Illinois' disastrous balance sheet to see how well that has worked. 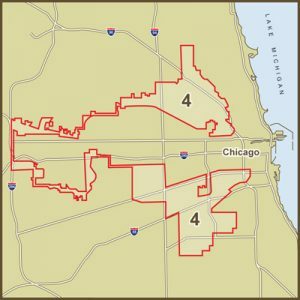 Madigan and his cronies, doing the bidding of organized labor and other special interests as well as their own interests, have energetically and successfully stifled any reform that would make Illinois redistricting fair. In a word, the process is corrupt. Rep, Luis Gutiérrez' district. "Compact and contiguous" it is not. Soon, our states will be redrawing their Congressional and state legislative district lines. It's called redistricting, and it will take place in 2021, after the next Census takes place. That may seem far off, but the time to get started on this issue is now. A major turning point for democracy, eh? Not in Illinois. But here's the capper: Obama will appear in Chicago at an OFA event on Nov. 8--the anniversary of last year's election--to pitch for redistricting reform. Can Obama be so blind as to miss the laughably high irony? Here he comes to a state having one of the nation's redistricting is among the most corrupt, to speak about reform? Will he even mention Illinois? Will he encourage Madigan to reform the process? Will he call on Democrats to reform redistricting everywhere? Will the media even notice the irony? You will get your wish if your friend, the Republican boss in Wisconsin, loses Gill v. Whitford, which was argued before the Supreme Court earlier this month. If the Supreme Court follows your wishes and prohibits politically motivated gerrymanding, Democrats will be the big beneficiaries around the country. I don't mind if Democrats around the country will benefit. We, the people, will benefit. I agree. Now we will see what five members of the Supreme Court say about We the people.